The premise underlying Cadillac’s decision to market a subcompact car in the U.S. beginning in 1982 was perfectly sound. The luxury division of General Motors was looking for a way to reach younger consumers, and a smaller, more affordable offering made sense. It would enable the brand to bring new buyers into the fold sooner rather than later, and hopefully those customers would move up to a larger, pricier Cadillac when trade-in time came. What wasn’t sound was the decision to build that new, entry-level Cadillac on the same economy-car architecture every other GM division was using for their small offerings. Indeed, the Cadillac Cimarron was a mechanical clone of the other GM J-cars: the Buick Skyhawk, Chevrolet Cavalier, Pontiac J2000, and Oldsmobile Firenza. While not terrible cars, the GM J clan was not known for mechanical refinement or upscale accommodations. The Cadillac BLS sedan (right) was introduced for the 2005 model year; a BLS wagon arrived for 2007. The result of GM using common “parts-bin” elements to produce a Cadillac was cynicism and general dismissiveness from the automotive media and the general public—that, and relatively slow sales. Fast forward about 22 years. When General Motors again needed a smaller, more affordable Cadillac model to help crack the tough European market, you might expect the company to have applied a different formula to the problem, and not just rebadge an existing vehicle as a Cadillac—and you’d be half right. 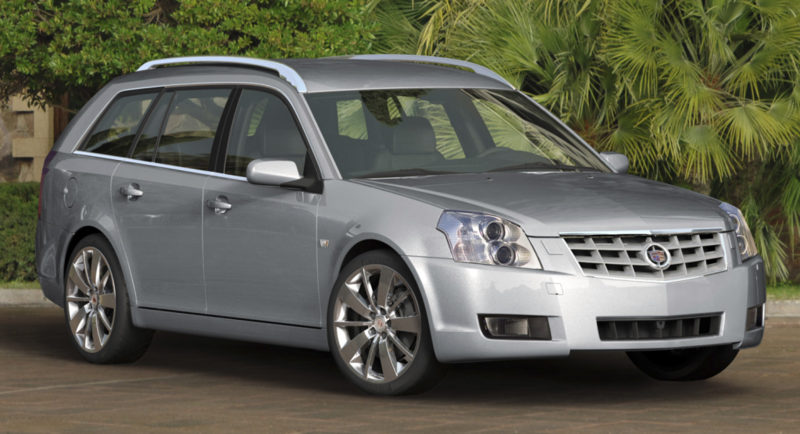 The Cadillac BLS was introduced for the 2005 model year, and was positioned below the Cadillac CTS in both size and price. Available only in Western Europe at first, the BLS would eventually be offered in a number of global markets, including Arabia, Mexico, South America, and South Africa—but never the U.S. Since GM wasn’t expecting huge sales, it needed the BLS to be both affordable to design and easy to build. With those goals in mind, the company chose to assemble the BLS in Trollhättan, Sweden, alongside the Saab 9-3—a vehicle the BLS had much in common with. Despite the cars’ common roots, the Cadillac BLS dash layout (left) was notably different from the Saab 9-3 (right). To call the BLS a 9-3 clone would overstate the point—unlike the Cadillac Cimarron and other GM J-Cars, the BLS and 9-3 shared little that was visible to the customer. Each car boasted unique sheetmetal, cabin design elements, and chassis tuning. That said, engines, transmissions, and the basic architecture were identical. The Saab 9-3 was generally a well-liked, well-reviewed car, but consumers and auto journalists didn’t take as kindly to the BLS. The initial media reviews were lukewarm, with many a critic questioning the BLS’s price. Also, because it was based on the Saab 9-3, the BLS was front-wheel drive—something many customers may have then found unseemly on a Cadillac. Kissing cousins? Despite its Saab heritage, the BLS (right) hewed closely to Cadillac’s Art and Science design language. The CTS (left) was also sold in the European market. To this editor’s eyes, Cadillac designers did a decent job marrying the company “Art and Science” design theme to the smaller canvas. And, interestingly, the BLS could be in had longroof form, making it the first-ever regular-production Cadillac wagon—the U.S.-market Cadillac CTS wagon didn’t debut until the 2010 model year. The BLS was offered with a number of engines, including a couple of 1.9-liter diesels, three 2.0-liter turbos, and a rather interesting turbocharged 2.8-liter V6 good for a solid 250 horsepower. All of these engines were also available in the Saab 9-3. Poor sales limited the BLS to a single design generation, with few notable upgrades taking place over the car’s six-year run. For the swan-song 2010 model year, production was moved from Trollhättan, to GM’s production facility in Kaliningrad, Russia. Written by: Tom Appel on November 20, 2017.on February 25, 2019.